Summary: Dry next few days, small chance of Tuesday night through Wednesday. Great looking weekend. First: Let’s start with what happened yesterday and why barely anyone in the Mid State saw precipitation during the afternoon. The below is my translation of things I’ve read from other meteorologists and were told. All the ingredients were there to create severe storms (instability, moisture, lift). The discussions all week have been IF storms develop, they would likely be severe. Once we got into Saturday, all the ingredients were still there. However, there was one thing missing: a “trigger” that would have mixed all those ingredients together to form severe storms and even supercells. That “trigger” moved farther northward than originally expected. This trigger was the warm front that stretches off of the surface low (surface lows are what cause moisture – surface highs are what cause really nice weather). 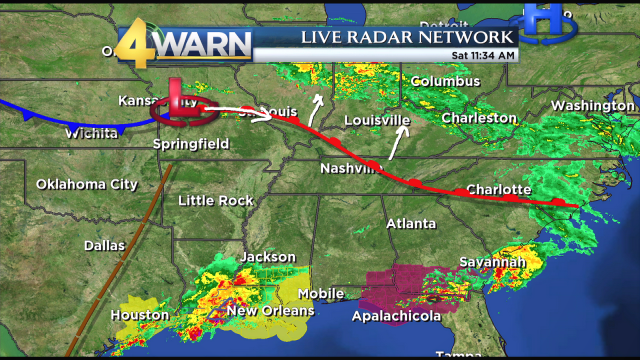 Borrowing an image from the WSMV weather blog, they outlined exactly where that warm front was (the red line). It moved farther north into Kentucky, actually splitting Kentucky in half horizontally (indicated by the arrows they drew). The surface low then will ride along that warm front and below it, storms form. This is how pretty much every low surface works in Tennessee: a warm front moves in bringing with it warm moist air from the Gulf, then the cold front (blue line) moves in and cools and dries the air, often with thunderstorms ahead of it. Not only did the warm front move farther north than expected, the storms that were occurring around New Orleans and the Florida panhandle acted like a wall to keep further moisture from making its way toward Tennessee. The special weather balloon launched by NWSNashville yesterday proves this. 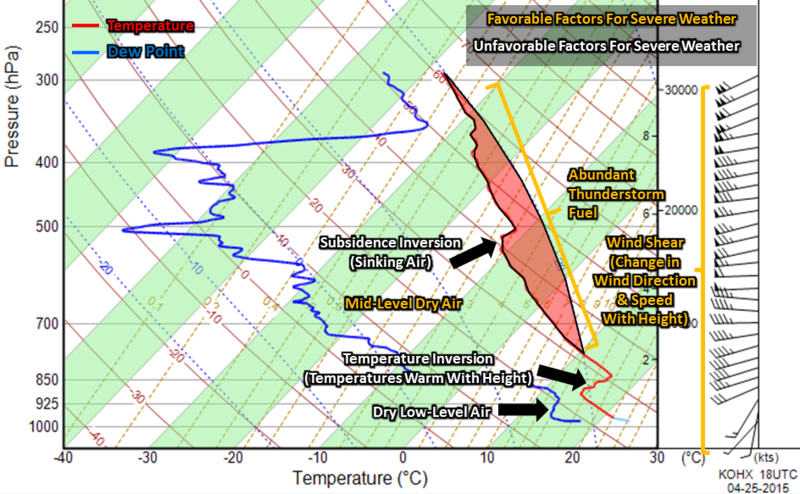 Here’s their Skew-T with positive and negative factors for severe weather outlined. Had the warm front settled on the Tennessee/Kentucky border as expected, and the moisture was not impeded by the storms along the Gulf coast, we could have had a very rough severe weather day. However, models overdid the amount of moisture that was expected to come into Tennessee, and they misjudged where the warm front would finally settle. Models can be wrong sometimes. WSMV wrote a good description of what happened and in more detail. Today: Cloudy start, then turns into mostly cloudy skies. Today we are starting the day with cloud cover brought in from the cold front overnight. Our temperature will be 15 degrees cooler than it was yesterday at 65 degrees. Winds are coming out of the north at 10 mph, making it feel a bit cooler than 65 degrees. Tonight, clouds clear out leaving us with mostly clear skies with a low of 44 degrees. Work week with hump day blues. The work week starts of chilly but warms up nice with sunny skies on Monday and a high of 68 degrees. Winds will come out of the north northeast at 5 to 10 mph. Monday night the low temp will drop to about 46 degrees. Tuesday during the day will be nice with increasing clouds and a high temperature of 65 degrees. As we get into the evening and overnight hours on Tuesday, a rainmaker system moves south of us, giving us a 30% chance of showers overnight while we see a low temp of 49 degrees. A 30% chance of showers remain Wednesday as the high works its way to 65 degrees. We aren’t expecting much of this rain if we do get hit with it. By Wednesday night, the rain chances drop to 20% while the low drops to 48 degrees. Thursday and Friday are shaping up to be nice with highs 69 and 71. The weekend also starts with no chances of rain so far!